The Multi-Cyclone Plus works on the basis of centrifugal water filtration. There are no moving parts to wear and tear, no filter media to clean or replace and is baced by Waterco's 2-year warranty. Incoming water enters 16 hydro cyclones tangentially, generating a strong centrifugal effect. The sediment is spun out to the hydro cyclone's wall and then spirals down to the sediment chamber. The filtered water migrates towards the centre of the hydro cyclone where the flow reverses and spirals upwards through the outlet. 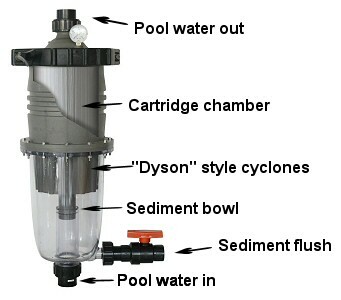 Accumulation of sediment can be visibly monitored through the Multi-Cyclone's clear sediment chamber. Multi-Cyclone is easy to insatll and fits to most existing pool filtration systems. It only takes 15 litres of water to flush the Multi-Cyclone. Whilst the water pump is running, simply open the sediment purge valve unitl the sediment has been flushed out. The Multicyclone Plus comes in two sizes. Delivery: Usually 2 to 4 working days.